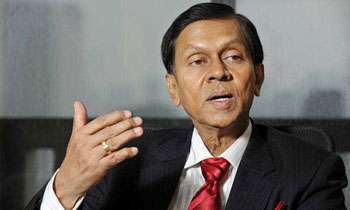 While claiming that the Government was attempting to find fault with former President Mahinda Rajapaksa, former CB Governor said they would never find any wrong doing of the former President. He expressed these views at a news briefing held yesterday at the Western Province Aesthetic Resort where they launched a new organization called ‘Voice for Justice’ with the membership of former secretary to Prime Minister Sirisena Amarasekara, Dr. Nalaka Godahewa, Rohan Weliwita and several others. Addressing the media, Former CB Governor Ajith Nivard Cabraal said the incumbent government was attempting to create some wrong allegations against the opponents of this government. “We saw how Minister Rajitha Senaratne was saying that he has seen in a document which shows that there is US$ 80 billion in the account of Mahinda Rajapaksa. These are all false,” Cabraal said. “The Government wants to create a false ideology amongst the general public on certain individuals who have become a threat to this government,” Cabraal added. He further said the new organization mainly aims at becoming a voice against the organized political victimization that was widely taking placing in this country. Meanwhile, Dr. Nalaka Godahewa said the underworld was on the rise and the government had been unable to tackle with this issue properly. You mean they are well hidden? Your comments appreciated and we also PROFESSIONAL know. Niward and Nalaka and their doing. Ha Ha Ha. Yes it was done in a very very professional way. Not like Ranil. If you use your knowledge and education for good reasons.you get good results,but can't override the yourconscious at any cost by getting the results good or bad you will have to accept the results. This is universal law of the God. Every one knows former President is alright,only the advisers taken the advantage of his kindness. I believe you. Anything else?? we chartered accountants know that your are a mouth piece of MR. Are you getting ready for CB Governor's post? Why don't your mind your own business. You can't find something that is physically not there. If looting, murder, human rights violations and war crimes are not offenses, then MR did not do anything wrong. Mr Cabral , your dad Doctor Cabral delivered me in Hospital and he was such a wonderful man. Surely , he will be turning on his grave if he knew about your Hedging Scandal as we as your Sisters association with PTL. It is well known that former President SOLD govt. land to Chinese company. Where were you, Mr. Cabral? In your mind, it is a "right doing"?